As part of their "Final Solution," the Nazis constructed a vast photographic archive of the very people they sought to destroy. Over the years, we have come to know and remember the victims of the Holocaust best through those images passed down by the Nazis. Great attention is paid to photographs and films of Jewish people starving in ghetto streets, suffocating in camp barracks and lying lifeless among hundreds of other victims in mass graves, unidentifiable as individuals and unrecognizable as human beings. This is how future generations were to remember the Jews of Europe, if at all. Nonetheless, the Nazis' photographic documentation is an invaluable tool for teaching the history of the Holocaust, as are the photographs taken to awaken conscience by Allied liberators. Indeed, the Holocaust is a crime so incomprehensible that such photographs seem to provide the only concrete form of evidence that the systematic destruction of a people was nearly carried out. To remember the victims of the Holocaust solely as they appear in these photographs not only denies them their right to be remembered as they would have wanted, but also risks lending credibility to Nazi rhetoric, labeling Jews as wretched parasites, unworthy of being included in society, for that is how they are portrayed in the Nazi's images. To refute this claim and eliminate risk, equal, if not greater value must be placed on the photographic records that remain of Jewish life before the Nazis came to power. Sadly though, the same impulse that drove the Nazis to document the destruction of European Jewry also accounts for the destruction of all evidence that would suggest their very existence in this world, much less their participation in and contributions to society. Personal photographs, family albums and letters - the last vestiges of home and family life - were among the few possessions that accompanied Jews to the extermination camps. Together with their owners, these cherished bearers of memory were reduced to ashes in the crematoria. Like the people pictured, precious few pre-war photographs escaped ruin and exist today. They were sewn into clothing and hidden in shoes; buried underground, beneath floorboards and inside walls; entrusted to non-Jewish neighbors and friends; and sent to loved ones living in other countries. In extremely rare cases, photographs remained with their original owners in the ghettos and camps for the duration of the war. Alternately, people visiting European relatives and friends returned home with photographs and film footage from their travels. 2 Together, these surviving fragments expose an important counterpoint to the Nazis' photographs, testifying to the diversity and vibrancy of Jewish culture that had flourished in Europe for centuries before being largely extinguished in the Holocaust. For six years, Holocaust Museum Houston has operated as a regional repository for Holocaust-related artifacts. Its collections define the history of the Holocaust, between 1933 and 1945, and are used for exhibition, research and other teaching methods. Its holdings also include a small collection of pre-war photographs. 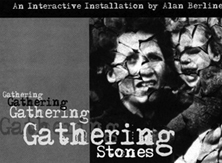 To bring this material to light in an interesting and meaningful way, the Museum commissioned New York filmmaker and media artist, Alan Berliner to incorporate photographs of people who perished in the Holocaust into his interactive installation entitled Gathering Stones. More than 100 photographs culled from the Museum's archives and local private collections are projected in a series of orchestrated sequences onto the "pages" of a monumental photo album represented by a bed of stones. The stones are intended to evoke the Jewish custom of marking a gravesite with a stone as a symbol of remembrance. In a spirit of participation and commemoration, visitors are encouraged to take a stone from the pile near the entrance and add it to the "album." This simple gesture offers renewed dignity to those with no headstone to mark their grave and acknowledges an enduring bond with them as collective ancestors to all mankind. 3 Consequently, as the stones placed by visitors accumulate and abstract the images, and as the images emerge and then dissolve - each projection gains and loses intensity over the course of one minute - a painful awareness of the frailty of memory and the struggle to preserve it comes into sharp focus. Each illuminated image provides a link to a loved one lost in the Holocaust. Local survivors, relatives and friends of Holocaust victims contributed photographs of immediate and extended family members, friends, and acquaintances. Salvaged from destruction, retrieved after liberation, or discovered over the years, the original photographs range in condition from pristine to crumbling, conveying the perils of their journeys and the circumstances of their survival. Likewise, they range in style from elegant studio portraits to casual vacation snapshots, and from straightforward identity card images to intimate glimpses at milestones in the life cycle. As expressions of individuals and collective identity, these photographs reveal valuable information about the subjects, the photographers, and the communities in which they were produced. Above all, they are markers of how people chose to remember themselves. Presenting these photographs together, along with the names of the people pictured and hundreds more names for which no image survived, Alan Berliner's Gathering Stones forms a composite family album, collapsing the distance between the victims of the Holocaust and the viewer. In this sacred space, where artifact becomes art and individuals unite in meditation, we are reminded that regardless of time, place, religion and race, we are more alike than we are different from one another.